Two and a half years after the U.S. removed export restrictions on its crude oil, its exports hit 3 million bpd —the latest all-time high set in recent months. The volume of U.S. exports last week was higher than the individual country exports of 12 out of 14 OPEC members. Only Saudi Arabia and Iraq export more than 3 million bpd of crude oil to international markets. The U.S. exports were also higher than the crude oil production of all but three OPEC members—Saudi Arabia, Iraq, and Iran. The rise in U.S. exports and the inevitable comparison with OPEC nations’ exports highlights the growing importance of U.S. oil on the international market. The 3-million-bpd export figure for one week is unlikely to be sustainable just yet, analysts think. U.S. exports fluctuate significantly week to week and face several obstacles to keeping that 3-million-bpd level for longer than a week. The previous U.S. export record was 2.566 million bpd in the second week of May 2018. U.S. exports exceeded 2 million bpd in just one week in 2017, but this year they have done so eight times, including the 3-million-bpd record last week. In the week to June 22, exports were 3 million bpd, compared to just 528,000 bpd for the same week in 2017, the EIA’s data shows. The four-week average to June 22 was 2.280 million bpd, versus a 581,000 bpd four-week average for the same week last year. In recent weeks, U.S. oil exports were supported by the wide discount, around $9 a barrel, of WTI Crude prices to Brent prices. A spread of this size makes U.S. oil cheaper for buyers than oil grades priced off the Brent benchmark, which has driven demand for U.S. oil higher in Asia and Europe. Surging U.S. oil production—which hit 10.9 million bpd this month—coupled with pipeline bottlenecks in the Permian—widened the WTI discount to Brent further. Over the past week, however, the WTI-Brent spread has narrowed significantly, also due to the outage at the 360,000-bpd Syncrude oil sands facility in Fort McMurray, Alberta, which strained North American oil supplies. 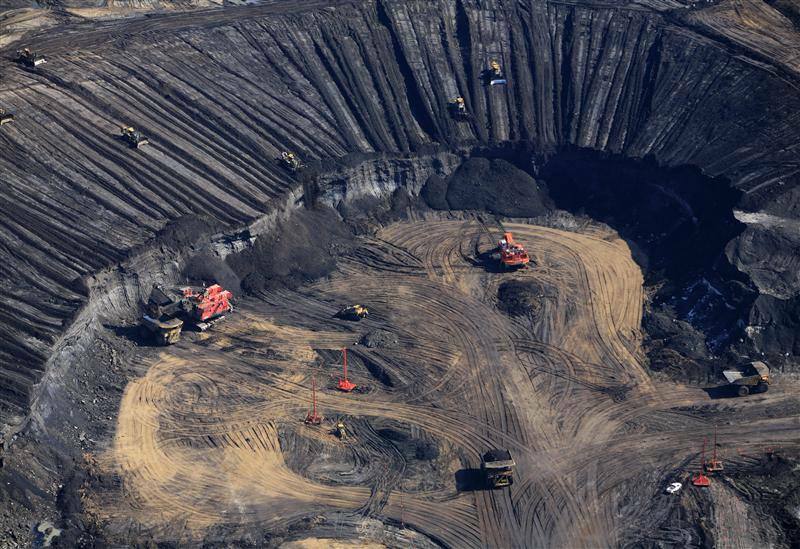 Production at the Canadian oil sands facility is likely to remain offline at least through July, a spokeswoman for Suncor, the majority owner of the project, confirmed on Tuesday. This would drain more of the U.S. stockpiles in Cushing, Oklahoma, further boosting WTI Crude prices, analysts say. The EIA’s latest inventory report on Wednesday showed a massive 9.9 million bpd draw, much higher than expected. “The fact is we’re loading crude oil for export across the Texas Gulf Coast. The biggest issue that exporters are facing is getting oil from the Permian basin to the Gulf Coast because of the lack of pipeline capacity,” Andrew Lipow, president of Lipow Oil Associates, told CNBC. 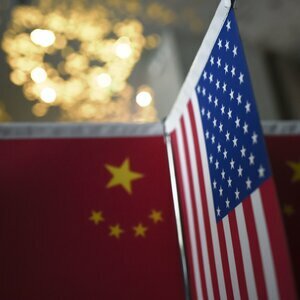 Another U.S. export hurdle could be China slapping tariffs on American energy imports amid the ongoing trade spat. Although this is currently just in the realm of possibilities and speculation, a 25-percent tariff on U.S. oil would make it uncompetitive in China, where American crude has already started to bite into the market shares of OPEC and Russia. The U.S. may be able to find other buyers for its oil, but the rate of exports would depend more on the WTI-Brent spread and the Permian’s takeaway capacity. In other words, on the price of U.S. oil on the market, and on how fast and at what cost the oil can be shipped from West Texas to the Gulf Coast ports. 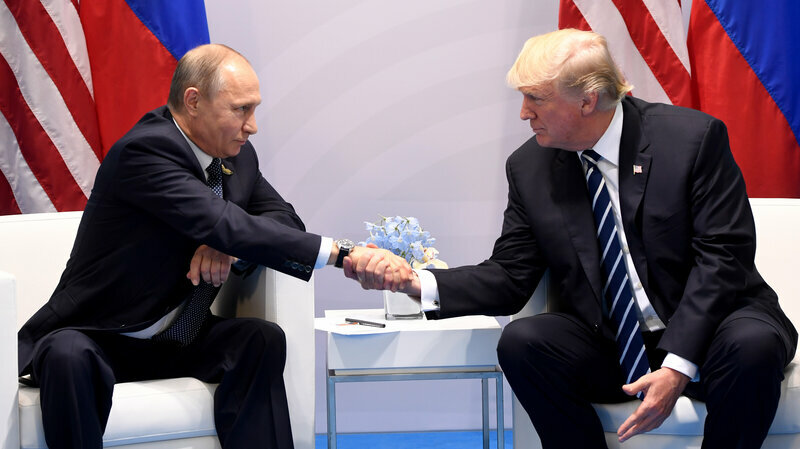 President Trump and Russian President Vladimir Putin will discuss relations between the United States and Russia and a range of national security issues when they meet in in Helsinki on July 16. The meeting will follow a NATO summit in Brussels on July 11. "I think we'll be talking about Syria. I think we'll be talking about Ukraine. I think we'll be talking about many other subjects," Trump told reporters at the White House on Wednesday. "Maybe something positive will come out of it," the president said. "I've said from day one, getting along with Russia and with China and with everybody is a very good thing. It's good for the world. It's good for us. It's good for everybody." Plans for the summit came into focus after Trump's national security adviser, John Bolton, met with Putin in Moscow on Wednesday. He acknowledged that any meeting with Putin is likely to generate some "political noise" in the U.S., where Trump has been dogged by a special counsel's probe into Russia's interference in the 2016 presidential election. "A lot of people have said or implied over time that a meeting between President Trump and President Putin would somehow prove some nexus between the Trump campaign and the Kremlin, which is complete nonsense," Bolton said. "The president recognizes there may be some criticism of this decision to have the meeting. You've heard some of it here today. But what must guide his conduct of American foreign policy is the pursuit of American national interests. And he judges — correctly in my view — that this bilateral summit between himself and President Putin is something he needs to do and will do, regardless of political criticism at home." Bolton said he discussed Russia's election meddling during his meeting with Putin and he expected that it would come up again when Trump and Putin meet. 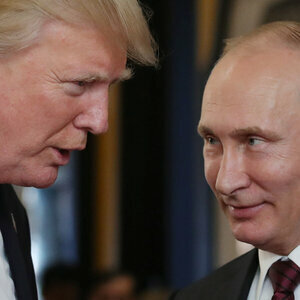 U.S. intelligence agencies say Russia intervened in the campaign to boost Trump's chances, although Putin denied that when the two leaders have met in the past. Before a G7 meeting earlier this month, Trump suggested that Russia should be invited to rejoin the group. Russia was kicked out of what was then the G8 in 2014, in retaliation for the country's invasion of Crimea. Bolton said he didn't discuss G8 membership with Putin but it could come up during the summit with Trump. Most other G7 leaders have rejected the idea of letting Russia back in, although Italy's new prime minister appeared to entertain the suggestion. Despite international sanctions against Moscow for its actions in Ukraine, Syria, and elsewhere, Bolton noted that world leaders have continued to meet with Putin. Bolton himself was critical of engaging with Russia before he joined the Trump administration. But he suggested reporters shouldn't dwell on his earlier commentary. "I don't really address what I've written in the past or what I've said on television," Bolton said during his Moscow news conference. "Right now, I'm an adviser to President Trump. It's his agenda that we're pursuing. And that's the agenda that I intend to advance." Although oil prices have been all the talk, given last week's OPEC+ decision to add 1 million b/d of new supply, let's hit on oil's most important product: gasoline, where prices have been falling from their four-year highs. Crude oil (petroleum) of course is the main input to making gasoline, so the price of it accounts for most of the price of gasoline, 50% last year but almost 70% back in 2011. With "OPEC Deal a Fantastic Opportunity to Get Short WTI," gasoline prices could fall further as U.S. crude production is closing in on another record of 11 million b/d. Oil prices constitute the bulk of the price of gasoline. It's no wonder then that we've seen a very clear connection between the price of crude oil and the price of gasoline . Low oil prices are therefore especially important because they lead to lower gasoline prices, which critically means more disposable income for Americans to spend and expand the economy. Some 75% of U.S. economic growth is built on consumer spending. Gasoline is the classic low elasticity product, where changes in prices have little influence on demand. Yes, electric vehicles and alternative transportation fuels/methods are becoming more important, but gasoline will remain Americans' main fuel to travel for decades to come. In fact, absolute reductions in U.S. gasoline demand have been non-existent. Crude oil prices largely determine the price of gasoline. The link through the years has been right on target. As we head deeper into summer 2018, remember that this is when we typically see the highest gasoline prices. Obviously, the nicer weather encourages more driving and thus more demand, but the higher quality, more expensive summer blend required to hit the market by May 1 also spikes prices in the hotter months. Ultimately as I see it, with our country expected to add $16 trillion in economic growth (a conservative estimate IMO) and 130 million more people by 2050, projections of significant declines in U.S. gasoline demand (and/or oil demand) can be chalked up to wishful thinking . Substitutes are few and far between. The shutdown of a key oil-sands facility in Canada is flipping the global oil market on its head and slamming shares of producers that depend on the plant. Just as OPEC and allied producers agreed to pour more oil into global markets, a transformer blast first reported by Bloomberg News last week cut power to Alberta’s giant Syncrude plant, which turns heavy crude into synthetic light oil for U.S. markets. As less oil flows from up north, traders are paying a record premium for crude at America’s biggest distribution hub in Cushing, Oklahoma. Globally, the gap between Brent crude and West Texas Intermediate is narrowing rapidly after widening for months. Goldman Sachs Group Inc. called the shutdown the most dramatic event in the oil market last week, as opposed to OPEC’s meeting in Vienna. Shares of Suncor Energy Inc., which controls the plant, plunged the most in more than two years. The 350,000-barrel-a-day facility, one of the biggest of its kind in the world, is going to be out of commission until the end of July, the company said. The expected shortfall in supplies follows five straight weeks of shrinking inventories at Cushing, the delivery point for WTI contracts. 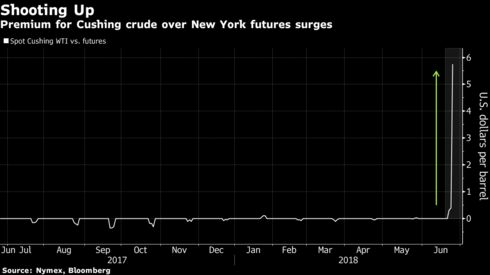 The price for the U.S. benchmark for immediate delivery at the hub, which is typically equal to futures on the New York Mercantile Exchange or just a few cents different, surged to an unprecedented $5.75 a barrel more on Monday. The disruption is helping set the U.S. apart from the rest of the world and intensifying a U-turn in the dynamics of the global market. While Saudi Arabia’s push to make sure OPEC boosts supplies by close to 1 million barrels a day is strongly weighing down on Brent crude futures in London, the shortage in Canada is supporting U.S. prices. That’s helping narrow the gap between the two benchmarks, reversing months of widening when the focus was on record production from shale fields. It has global implications because the premium helps buyers around the world decide whether to ship crude from the U.S. or elsewhere. Brent traded at less than $8 dollars above WTI on Monday, compared with almost $12 just two weeks ago. In Canada, the outage is pummeling shares of Suncor, which owns a 59 percent stake in the operation. Having the facility down through July could cut Suncor’s third-quarter production to about 770,000 barrels a day, short of the 812,000-barrel analyst consensus, Tudor Pickering Holt analysts said in a note. Suncor slid as much as 4.6 percent to C$50.88 in Toronto, the biggest intraday decline since February 2016. Imperial Oil Ltd., which owns 25 percent of Syncrude, slid as much as 1.5 percent. The remainder of the operation is owned by China Petroleum & Chemical Corp., which holds 9 percent, and CNOOC Ltd.’s Nexen, which owns about 7 percent. Last week’s outage is just the latest mishap at Canada’s second-oldest oil-sands mine, which started operation in the mid-1970s and has faced reliability issues in recent years. The plant last month underwent scheduled maintenance that took longer than expected. LONDON (Reuters) - Brent crude oil fell on Monday as investors prepared for an extra 1 million barrels per day (bpd) in output to hit the markets after OPEC and its partners agreed to raise production. Despite the increase, which is intended to stop the gap between global supply and demand from becoming too wide, analysts said global oil markets would likely remain relatively tight this year. Brent crude futures LCOc1 fell $1.15 to $74.40 a barrel by 1448 GMT, while U.S. light crude CLc1 rose 20 cents to $68.78 a barrel, supported in part by a Canadian supply outage. Prices initially jumped after an OPEC deal to increase output was announced late last week, as it was not seen boosting supply by as much as some had expected. OPEC and non-OPEC partners including Russia have since 2017 cut output by 1.8 million bpd to tighten the market and prop up prices. 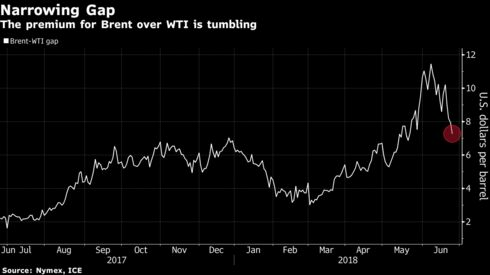 “OPEC are really going all-out to prevent oil prices from biting in the second half of the year,” SEB head of commodities Bjarne Schieldrop said. After officially meeting on Friday, OPEC gave a press conference on Saturday that implied a bigger increase in supply. “Saturday’s OPEC+ press conference provided more clarity on the decision to increase production, with guidance for a full 1 million bpd ramp-up in 2H18,” Goldman Sachs said in a note on Sunday. “This is a larger increase than presented Friday although the goal remains to stabilize inventories, not generate a surplus,” the U.S. bank added. Largely because of unplanned disruptions in places such as Venezuela and Angola, the group’s output has been below the targeted cuts, which it now says will be reversed by supply increases, especially from OPEC leader Saudi Arabia. Analysts warn however there is little spare capacity for large-scale output increases. “As yet there is no plan as to how the limits will be reallocated. One simple approach would be to reduce the limits of those not producing enough by 600,000 bpd and increase the limits of members with spare capacity by 600,000 bpd – this would enable 100 percent compliance,” said Callum MacPherson, Investec head of commodities. Goldman Sachs also warned that an “outage at Syncrude Canada’s oil sands facility could leave North America short of 360,000 bpd of supply for all of July”. It added that this “will exacerbate the current global deficit, making the increase in OPEC production all the more required”. The premium of Brent crude over U.S. futures narrowed to around $5.21 a barrel on Monday, down from nearly $10 a week ago, thanks to the steep drop in the premium of U.S. coastal grades over the West Texas Intermediate benchmark price. On March 23, 2018 President Trump’s new tariffs on U.S. steel and aluminum imports went live, creating a ripple effect on other commodity markets across the globe. In response, several other countries announced retaliatory tariffs of their own on critical American exports including pork products, metals, and even bourbon. 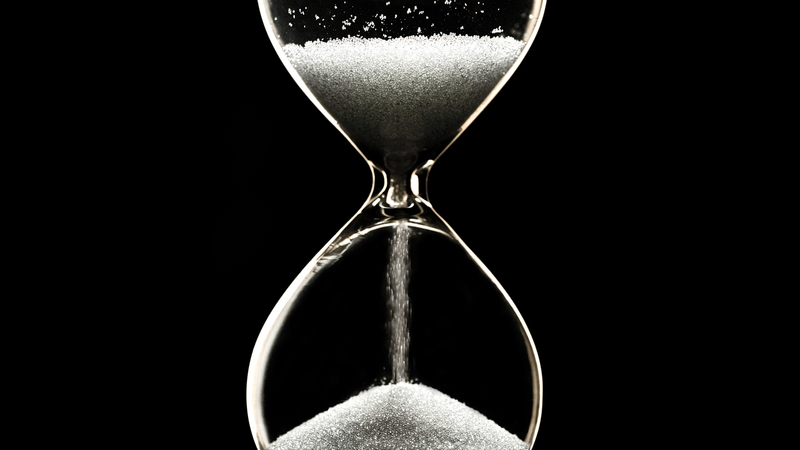 With the May 31 exemption deadline now two weeks in the rear view, the impact on one critical US export, ethanol, is yet to be seen. China already imposed an additional 15 percent tariff on U.S. ethanol, which may pave the way for other major commodity destinations to follow suit. Brazil and Canada alone account for 57 percent of all 2017 ethanol exports, so a retaliatory response in one of these critical regions may have global impact. The Trade Expansion Act of 1962 provides the construct for crafting international trade agreements with specific U.S. industries and impacts in mind. Section 232 gives the President authority to make changes to trade arrangements in the interest of national security once significant evidence presents a risk or threatening impact. In the case of the 2018 tariffs, the U.S. Commerce Department conducted an investigation and submitted a report asserting steel and aluminum imports “threaten to impair the national security as defined in Section 232.” The report concluded "the present quantities and circumstance of steel imports are 'weakening our internal economy' and threaten to impair the national security.” This little-known piece of legislation was only initiated twice in U.S history, in 1979 to place a tariff on Iranian oil imports and then in 1982 to halt crude imports. The recent initiation places a 25 percent tariff on imported steel and a 10 percent tariff on imported aluminum. After the initial roll-out, countries such as Mexico, Canada, and the European Union were given temporary exemptions through May 31, 2018. Other countries, such as Brazil, chose to accept import limits to avoid the tariffs. The tariff’s impact on domestic ethanol supply is unknown at the moment. After the President’s office announced the tariff in late March, ethanol production remained steady with production averaging around 1,040,000 barrels per day (bpd) according to Energy Information Administration’s (EIA) Weekly U.S. Oxygenate Plant Production of Fuel Ethanol Report. In mid-April, production slowed, reaching 985,000 bpd before rebounding in late-April and early-May. Genscape's Ethanol Production Monitor, which monitors ethanol plant shutdowns across the U.S. in real-time, revealed the same trend, however, the production slowdown during this time may not necessarily indicate a change due to the tariffs. Historically, the last four years show a similar April ethanol production slowdown. Genscape also saw large storage net withdraws in March in Chicago, New York Harbor, and especially Louisiana according to Genscape's Ethanol Inventory reports. The market responded and inventory prices dropped after the withdraws, which happened around the same time the tariffs were introduced. This year, extremely large amounts of ethanol left the U.S. from February through April, primarily due to Brazilian exports, the majority of which came from the Gulf Coast. Record volumes may imply that additional tariffs could eventually come from countries that the U.S. exports to. Ethanol Exports Monitor, a report that collects daily-level storage changes and detects ethanol vessel loading events in the Gulf Coast, currently shows a drop-off in exported volumes expected in May. The report also shows there was a rush of ethanol shipments into China just prior to the tariffs levy. Prior to the 232 tariff action, China already had a 30 percent tariff on U.S. ethanol imports and added an additional 15 percent as a tariff response. The late 2017 arbitrage window opening further strained the ethanol import opportunity in China, adding to a volatile trade relationship. While the tariff is active, Genscape expects the arbitrage window for U.S. ethanol exports to China to be firmly shut. China will likely look to Central and South America for ethanol imports out of necessity. In 2017, the Chinese government announced a nationwide ethanol mandate, which requires the entire country to use E10 by 2020. While there are other ethanol suppliers, it’s unlikely China will meet this mandate without importing ethanol or corn from the U.S. The arbitrage window in Brazil is currently open, for how long is the question. Brazil accepted a hard quota to avoid the tariff on steel imports. Brazil is the second-largest exporter of steel to the U.S., so if any issues arise with the quota, Brazil may impose additional tariffs on ethanol. Since Brazil is the top ethanol destination since 2017, this could choke the export chain. Brazil currently has a 20 percent tariff on U.S. ethanol imports that exceed a 600 million liter rate quota. Since ethanol prices remain low for 2018, U.S. ethanol imports remain active in Brazil as evidenced by record-level imports in the last three months. No new retaliatory tariffs were issued since exemptions ended in May. Canada and Brazil are on watch as the top ethanol importers, and Genscape intends to monitor further tariff implications to gauge market impact. Our Ethanol Supply Chain Services proprietary monitoring technology provides weekly measurements of inventory levels at key U.S. storage hubs as well as daily gas nomination data for ethanol facilities. The service offers a full holistic view to market participants to gain a complete understanding of the U.S. ethanol supply chain and make more strategic decisions. To receive the latest information on U.S. ethanol production, storage, and exports, please click here to learn more about Genscape's Ethanol Supply Chain Services. The United States has again outstripped Saudi Arabia as the holder of the world’s biggest recoverable oil resources with current technology, largely due to the doubling of fracking operations in the Permian, according to data by research consultancy Rystad Energy. The U.S. added nearly 50 billion barrels in 2017 and now has an estimated 310 billion barrels of recoverable oil, which are equal to 79 years of U.S. production at the current pace of output, Rystad said. Apart from the Permian, where more reserves per well are drilled, new areas and formations that have been geologically proved boosted the U.S. recoverable oil resources last year, according to the Norway-based energy consultancy. “Texas alone now holds more than 100 billion barrels of recoverable oil, 90% of which is from shale or other tight formations, ie. from wells that require hydraulic fracking to produce commercial quantities of oil,” said Rystad Energy. The “recoverable oil” figures include expected production from future discoveries that Rystad deems likely. Out of 1 trillion barrels of yet undiscovered oil globally, shale oil makes up close to 300 billion barrels, according to Rystad Energy’s database. Some 78 percent of these yet-to-be-discovered oil resources are in non-OPEC countries. In terms of oil that has already been discovered, Saudi Arabia continues to be the undisputed leader, holding 246 billion barrels of discovered oil, which is 90 billion barrels more than the discovered oil in the United States, according to Rystad Energy. According to Rystad data, the new commercially proved reserves added in 2017 outpaced last year’s production and consumption level globally, signaling that there is a sustainable inventory of oil for the short term. Although the Petroleum Resource Management System (PRMS) from the Society of Petroleum Engineers (SPE) provides a widely accepted scheme for classifying petroleum reserves and resources, the term ‘proved reserves’ is used very differently around the world. “Compilations of government reported oil reserves are a mix of apples and oranges, and the standards differ largely between OECD and OPEC countries,” Per Magnus Nysveen, Head of Analysis at Rystad Energy, said. Tsvetana is a writer for the U.S.-based Divergente LLC consulting firm with over a decade of experience writing for news outlets such as iNVEZZ and SeeNews. Saudi Arabia, and Russia proposed gradually relaxing production cuts in place since 2017 for fear that the oil market could overheat. OPEC members Iran, Iraq, Venezuela and Algeria have opposed a radical increase in production. Russia and Saudi Arabia are pushing OPEC and its allies to raise oil output steeply from July to meet growing demand and cover supply outages in Venezuela and Libya despite opposition from several members of the producer group including Iran. "Oil demand usually grows at the steepest pace in the third quarter ... We could face a deficit if we don't take measures," Russian Energy Minister Alexander Novak told reporters. "In our view, this could lead to market overheating." Novak said Russia wanted OPEC and non-OPEC to raise output by 1.5 million barrels per day (bpd), effectively wiping out existing production cuts of 1.8 million bpd that have helped rebalance the market in the past 18 months and lifted oil prices LCOc1 to $75 per barrel from as low as $27 in 2016. 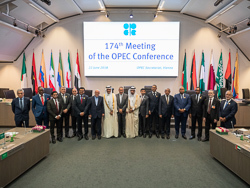 The Organization of the Petroleum Exporting Countries meets on Friday to decide output policy amid calls from major consumers such as the United States and China to cool down oil prices and support the global economy by producing more crude. OPEC's de facto leader, Saudi Arabia, and non-member Russia have proposed gradually relaxing production cuts - in place since the start of 2017 - while OPEC members Iran, Iraq, Venezuela and Algeria have opposed such a move. Three OPEC sources told Reuters a technical panel - the organization's economic commission - met on Monday to review the market outlook and forecast strong global demand for oil during the rest of 2018. "If OPEC and its allies continue to produce at May levels then the market could be in deficit for the next six months," one of the sources said. Some countries including Algeria, Iran and Venezuela said at the panel meeting that they still opposed an output increase, one of the sources said. Demand growth has surprised market watchers on the upside in the past two years, with annual increases exceeding 1.5 percent. Global oil consumption is expected to hit 100 million bpd next year. 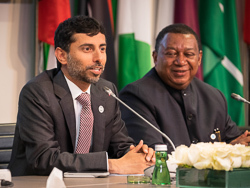 Novak said that if a decision were taken this week to raise output, OPEC and its allies could meet again in September to review the impact and fine-tune production policy. 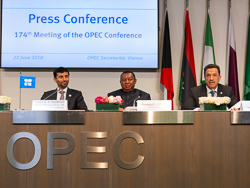 The energy ministers of Kuwait, Angola and the United Arab Emirates declined to comment on Tuesday when arriving in Vienna, where the 14-member OPEC is headquartered. On Monday, Ecuador's oil minister Carlos Perez predicted a difficult OPEC meeting. "There are other countries that do not want to reduce the cuts ... It's going to be a difficult ... a tough meeting," Perez said in the Austrian capital. OPEC's second- and third-largest producers, Iraq and Iran, have said they would oppose output increases on the grounds that such moves would breach previous agreements to maintain cuts until the year-end. Both countries would struggle to increase output. Iran faces renewed U.S. sanctions that will impact its oil industry and Iraq has production constraints. Two OPEC sources told Reuters that even Saudi Arabia's Gulf allies Kuwait and Oman were against big, immediate increases in output. One OPEC source said the Saudi-Russian proposal of a 1.5-million-bpd increase was "just a tactic" aimed at persuading fellow members to compromise on a smaller rise of around 0.5-0.7 million bpd. Saudi Arabia and its Gulf allies have the capacity to raise output. Russia has also said that limiting supply for too long could encourage unacceptably high output growth from the United States, which is not part of the production agreement. On Tuesday, the head of Russia's second-largest oil firm Lukoil (LKOH.MM), Vagit Alekperov, said global production cuts should be halved and that Lukoil could restore its oil output levels within two to three months. Commerzbank commodities analyst Carsten Fritsch said that given big differences in the positions of OPEC members, the Friday meeting was likely to be tough. 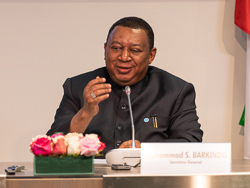 "Unanimity is needed for any OPEC decision. This recalls the June 2011 meeting, when OPEC was unable to agree on an increase in production to compensate for the outages ... in Libya," Fritsch said. "That meeting ended without any joint declaration. The then Saudi Oil Minister Ali al-Naimi described it as the worst OPEC meeting of all time." Adding to the tensions, Iran and Venezuela continued to insist that OPEC on Friday debate U.S. sanctions against the two countries, but the organization's secretariat has rejected their requests, according to letters seen by Reuters. Exxon Mobil said Tuesday it plans to create a joint venture with Houston's Plains All American Pipeline to construct a multibillion-dollar pipeline stretching from west of Midland to the Houston and Beaumont areas that would carry oil and condensate. The next OPEC meeting due on 22nd June is shaping up to be one of the more significant gatherings. Discussions will centre around whether to maintain production cuts or increase production. Naturally, the tanker market is hoping for production increases, Poten & Partners said in a comment. Since the current production restrictions came into effect in January, 2017, oil prices have increased from $55 to $80 per barrel for Brent. US Commercial inventories have come down by 100 mill barrels from a peak of 534 mill in April, 2017 to around 436 mill barrels in the first week of June, 2018. While these two elements seem to indicate that the OPEC cuts have achieved their objective, it remains highly uncertain what OPEC (and non-OPEC participants, like Russia) will ultimately decide to do. The tanker market is holding its collective breath. A meaningful increase in long-haul flows from some of the key OPEC exporters would go a long way in turning the crude tanker market around, especially since it will impact the physical market, as well as provide a boost to the all-important market psychology. While the production cutbacks and resulting oil price increases seem to have turned OPEC members finances around, some countries are benefiting more than others. Revenues declined by an average of 45%, before the cuts. As the largest OPEC producer and exporter, Saudi Arabia suffered the most. The value of the Kingdom’s petroleum exports dropped from $284 bill in 2014 to $153 bill in 2015, so it was no surprise that OPEC decided in 2016 that it needed to curtail production. This led to a significant recovery in price, which boosted the revenues for all OPEC members. However, the total value of exports remains significantly below the 2013/2014 numbers. The different OPEC members paths may diverge from here. Sticking to the production agreement may lead to higher oil prices and this will further improve OPEC’s finances. However, the world economy is not immune to higher oil prices and pressure from the US on OPEC is building to increase production. Unfortunately, while higher prices help all OPEC members (at least in the short term), a production increase will only benefit the countries with spare capacity (ie, mostly Saudi Arabia). Not surprisingly, Venezuela and Iran would rather keep the production cuts in place, as neither country has much, if any, spare capacity and both are facing US sanctions, which could lead to further reductions in output. Iran’s exports will be facing challenges when sanctions start to bite in November. What are the possible scenarios for the tanker market? The worst case would be a decision later this month to do nothing, ie continue the production cuts. This will lead to rising prices, as problems in Venezuela continue to mount and many Iranian buyers gradually start to reduce their purchases to avoid US sanctions. As we move closer to the November cut off, Iranian exports may decline further. A tightening oil market in combination with rising geopolitical tension could push oil prices to levels where it starts to impact global demand. Rising US oil production is a positive for global oil balances, but, due to a lack of pipeline capacity, US shale producers are facing increasing problems getting their product to (export) markets. The best-case scenario for the tanker market would be a decision by OPEC to boost output, mainly from producers in the Middle East (Saudi Arabia, UAE, Kuwait). Combined with Iranian sanctions and more floating storage, this could reverse the decline in OPEC-related tonne/mile demand that resulted from the production cuts in 2017. Falling oil prices may provide an additional boost to tanker demand as it stimulates oil demand growth and stock building. We don’t know what will happen, but we do know what tanker owners are hoping for, Poten concluded. Some analysts are already predicting a rise in production at next week’s meeting - Ed. HOUSTON (Reuters) - Venezuela is considering producing fuels from foreign crude oil for the first time, according to planning documents seen by Reuters, as the country struggles to meet its obligations despite having the world’s largest crude reserves. State-run oil company PDVSA may process up to 57,000 barrels per day (bpd) of foreign crude in June at the country’s largest refinery, according to a monthly refining plan which was viewed by Reuters on Wednesday. The output would help fulfill fuel contracts for Russian, Chinese and other customers and reduce purchases of fuels for domestic use, the documents showed. PDVSA did not respond to a request for comment. PDVSA has been falling short on fuel exports in recent years due to a lack of lighter crudes to refine, a shortage of spare parts, poor maintenance, and management upheaval at its domestic refining network. PDVSA also lost access in May to inventories produced in Curacao, where it operates the Isla refinery. Declining revenue resulting from falling oil production and exports have driven Venezuela into a severe economic recession, and led to a loss of skilled workers, and widespread food and medicine shortages. Some energy experts say further production declines could contribute to a global crude shortfall. U.S.-based ConocoPhillips (COP.N) last month seized some of PDVSA’s assets in the Caribbean seeking payment for a $2 billion arbitration award, reducing PDVSA’s ability to deliver fuel and crude exports to Asian customers and regional allies. Venezuela, an OPEC member country, has never before imported foreign crude oil for its domestic refineries, although it has blended African, Russian and U.S. crudes with its extra heavy oil to make exportable products. It also has purchased foreign oil for Caribbean refineries and to supply allies, including Cuba. In May, the country produced 1.53 million bpd of crude, according to numbers delivered to OPEC, but other sources put the figure at 1.39 million bpd, which would be the lowest monthly output since the 1950s. If PDVSA chooses to refine the imported crude, one of two scenarios outlined in documents showing its production, supply and contract requirements, the imports would alleviate a lack of domestic lighter crudes needed at the refineries, which have been running at about a third of their capacity. It could use Russian, Iranian or Angolan crudes, according to the documents. “The larger processing of crude would increase our fuel availability. It would also decrease the requirements (to import) of vacuum gasoil and diesel,” said one of the documents prepared in May. The alternative, not using imported crude, would mean the shortfall in fulfilling contracts to supply fuel would increase, the document showed. Most of these fuel contracts cover oil-for-loans with Chinese and Russian companies. As of June 13, two tankers holding Russian Urals crude were waiting in Venezuelan waters to discharge, according to Thomson Reuters vessel tracking data. One of the two, the Advantage Atom, is waiting near its Amuay refinery. Venezuela in January started routine imports of Urals crude to supply Cuban refineries, spending nearly $440 million on the purchases for its Caribbean ally. The Urals cargoes had been discharged in Curacao for transfer to Cuba, but since Conoco began seizing PDVSA’s Caribbean assets, tankers arriving from Russia have been diverted to Venezuela’s Paraguana Refining Center (CRP), which includes its Amuay and Cardon refineries. To meet its domestic demands and PDVSA’s fuel supply contracts, Venezuela would have to produce some 850,000 bpd of fuels, the documents show. Neither of the June alternatives show it getting close to that level. If PDVSA decides to process the foreign crude, it would produce 606,000 bpd, and less if it does not. From January through March, PDVSA’s refineries supplied 78 percent of the 365,000 bpd of the fuels demanded by Venezuela’s domestic market, which forced the company to import finished products including gasoline and diesel. Under the plan excluding foreign oil imports, PDVSA’s domestic refineries this month would work at about 36 percent of their total capacity, or 473,000 bpd of Venezuelan crude, according to the documents, reflecting an acute lack of spare parts and delayed maintenance projects. On Wednesday, PDVSA’s 310,000-bpd Cardon refinery restarted a vacuum distillation unit that was waiting for spare parts to be repaired. Last week, the 645,000-Amuay refinery restarted one of its crude distillation units. Those repairs are just some of the many still pending, according to the documents. At Venezuela’s smallest refineries, Puerto la Cruz and El Palito, the lack of medium and light crudes has kept several distillation units out of service for months. The insufficient fuel production is affecting China’s CNPC [CNPC.UL] and its subsidiaries the most as PDVSA would have to ship 258,000 bpd of fuel oil and jet fuel to these companies for repaying Chinese loans extended to the Venezuelan government in the last decade, but it typically delivers less than 100,000 bpd. Russia’s Rosneft (ROSN.MM) this month is entitled to 80,000 bpd of fuel oil, jet fuel and natural gasoline under oil-for-loan contracts, while Cuba and members of Petrocaribe should receive at least 108,000 bpd, according to current contracts. US president Donald Trump left experts baffled when he said North Korea had agreed to destroy a missile engine testing site, but it now looks like North Korea is making good. North Korea will reportedly destroy a large-scale facility in Tongchang-ri, North Pyongan Province that was used to test engines for the intercontinental-range ballistic missile, the Hwasong-14. The Hwasong-14 was the first North Korean missile experts said could hit the US mainland with a nuclear payload. Measures like the destruction of testing sites in North Korea, if monitored by US and international experts, could build the kind of trust needed to carry out denuclearization. US president Donald Trump left experts baffled when he said North Korea had agreed to destroy a missile engine testing site after emerging from his summit with Kim Jong Un, but it now looks like North Korea is making good. "They secured the commitment to destroy the missile engine testing site. That was not in your agreement," Trump said in a press conference after the summit, referencing the joint statement which made no mention of concrete steps towards denuclearization. "I got that after we signed the agreement. I said do me a favor. You have this missile engine testing site. We know where it is because of the heat. It is incredible the equipment we have to be honest with you. I said can you close it up. He's going to close it up," Trump continued. Trump's statement at the press conference confused many and may have even divulged a bit much on the military intelligence side, but now reports of the details of the testing site have surfaced. North Korea will destroy a large-scale facility in Tongchang-ri, North Pyongan Province that was used to test engines for the intercontinental-range ballistic missile, the Hwasong-14, according to South Korea's Chosun Ilbo. "Kim promised Trump during their summit on Tuesday to dismantle this facility," a diplomatic source said told Chosun Ilbo. "Kim Jong-un must have won a number of major concessions from Trump in other sectors in return for destroying such a major facility," the source continued. North Korea did win a number of concessions from Trump, who agreed, also outside of the joint statement, to stop US and South Korean military drills without consulting Seoul first. World leaders have praised the summit as a great step towards peace and reducing tensions. Measures like the destruction of testing sites in North Korea, if monitored by US and international experts, could build the kind of trust needed to carry out earnest denuclearization. U.S. President Donald Trump said on Monday his historic summit with North Korean leader Kim Jong Un in Singapore could “work out very nicely” as officials from both countries sought to narrow differences on how to end a nuclear stand-off on the Korean peninsula. Kim, one of the world’s most reclusive leaders, made an evening tour of sites on Singapore’s waterfront, on the eve of the summit that is due to get underway on Tuesday morning at a nearby resort island. While Trump was optimistic about prospects for the summit between the old foes, U.S. Secretary of State Mike Pompeo injected a note of caution ahead of the first-ever meeting of sitting U.S. and North Korean leaders, saying it remained to be seen whether Kim was sincere about his willingness to denuclearize. Officials from the two sides held last-minute talks aimed at laying the groundwork for a meeting that was almost unthinkable just months ago when the two leaders were exchanging insults and threats that raised fears of war. But after a flurry of diplomatic overtures eased tension in recent months, the two leaders are now headed for a history-making handshake that U.S. officials hope could eventually lead to the dismantling of a North Korean nuclear program that threatens the United States. Offering a preview to reporters, Pompeo said it could provide “an unprecedented opportunity to change the trajectory of our relationship and bring peace and prosperity” to North Korea. However, he played down the possibility of a quick breakthrough and said the summit should set the framework for “the hard work that will follow”, insisting that North Korea had to move toward complete, verifiable and irreversible denuclearization. Canadian and US pipelines are a study in contrasts, writes Poten & Partners in a comment piece. Recently, the Canadian Government announced that they are buying the Trans Mountain pipeline system and its expansion project from current owner Kinder Morgan for Can$4.5 bill. The expansion project, if it goes ahead, is expected to cost an additional Can$7.4 bill. This lifeline from the Canadian government became necessary after Kinder Morgan strongly considered pulling out of the project. Its importance is that it is the only Canadian pipeline that moves domestic crude to the country’s coastline for export. While its capacity is 300,000 barrels per day, some 221,000 barrels per day is allocated to refineries with connections in British Columbia (BC) and Washington State. Only about 80,000 barrels per day is allocated to the Westridge Terminal in Burnaby, BC (near Vancouver), which is only enough to load one Aframax (the maximum vessel size allowed at this facility) per week. This is only a trickle when compared to Canada’s oil production which, in March 2018, was a near a record 5.2 mill barrels per day, according to the IEA. Even if the expansion project goes ahead, tanker exports will remain relatively small. Looking back to late 2014/early 2015, the outlook for Canadian production and exports was rosy. Several export pipelines were planned and analysts (including Poten & Partners) were forecasting a significant change in tanker trade flows in the 2017/2018 time-frame. An overview of the North American pipeline proposals updated by the Canadian Association of Petroleum Producers (CAPP) in September, 2014, showed Keystone XL (+830,000 b/d), Energy East (+1,100,000 b/d), Northern Gateway (+525,000 b/d) and the Trans Mountain Expansion (+590,000 b/d). These projects combined represented more than 3 mill barrels per day of additional pipeline export capacity for Canadian oil producers, all to be completed before 2019. We are now in the middle of 2018 and none of this new capacity has materialised, Poten said. Northern Gateway and Energy East have been cancelled, the Keystone XL is still mired in legal problems (even though the Trump administration fast-tracked the State Department approval) and the Trans Mountain Expansion is on life-support. As mentioned, Canada produces about 5.2 mill barrels per day of crude oil (mostly in the Western States) while added to that, Eastern Canadian refiners import another 700-800,000 barrels per day of foreign crude. Canada only consumes only 2.3 mill barrels per day and almost all of the excess production (around 3.5 mill) currently goes to the US. Since US domestic production is growing rapidly, Canadian crude is facing more competition and the discount to international benchmark prices at which Canada is selling its crude to the US is significant. This costs Canadian producers an estimated Can$15.6 bill a year. Building some of the proposed export pipelines would have gone a long way to solving this problem, Poten said. While Canadian pipelines are struggling, the opposite situation exists in the south of the US. As a result of the shale boom, in particular in the Permian Basin in Texas, pipeline operators are planning more than 3 mill barrels per day of additional capacity, with 1 mill barrels per day already under construction. Oil is a global commodity and through the pricing mechanism, it will find a way to get to market. If it cannot be exported directly to Asia or Europe, Canadian crude will continue to move south of the border. Some of it may even be transported to the US Gulf coast and exported to Asia, Poten concluded.